I started this blog in 2008. 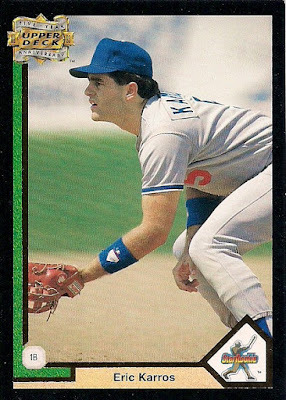 It doesn't seem that long ago, but it actually is when you consider the lifespan of a major league player with a major league team. 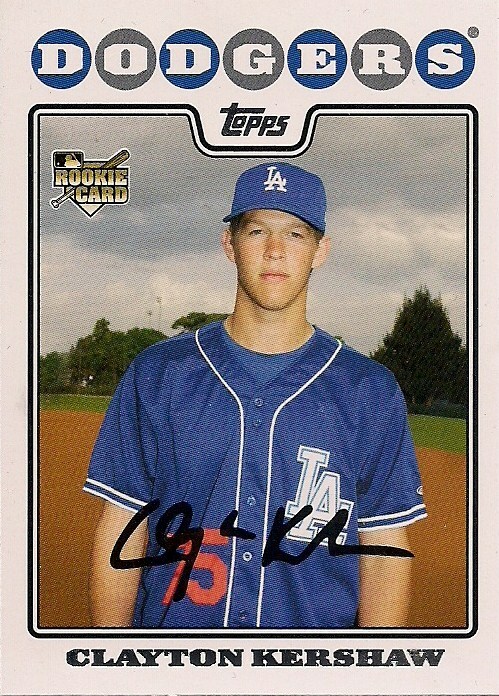 Clayton Kershaw is just one of two players who were featured with the Dodgers in a 2008 Topps set that is still with the Dodgers. 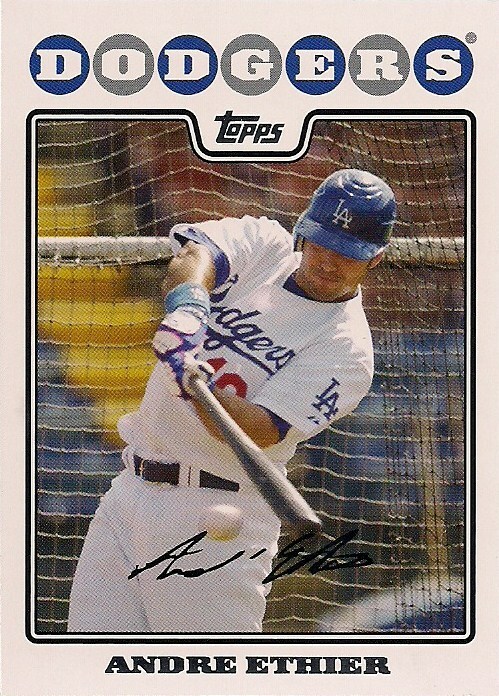 The other one is Andre Ethier. This despite the fact that he has been traded in my mind about 78 times in the last seven years. Rick Honeycutt is still the pitching coach. And Eric Stults is back with the team after a long time away, although he was sent down and may end up getting released anyway. 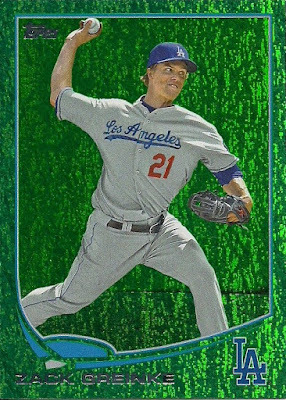 But back to Kershaw, because all that other stuff was a tangent. 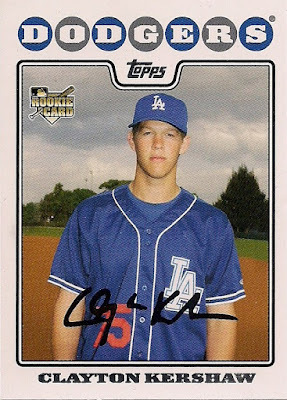 Back in 2008, I made a commitment to Kershaw. 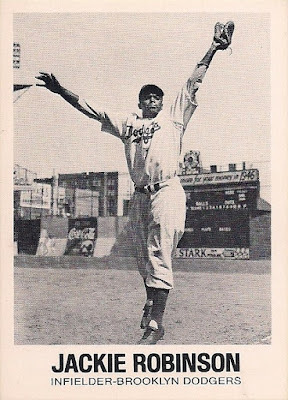 I saw a pitcher who would perform greatness and I was confident it would happen. In that year, I decided he was my favorite player and that I'd try to focus on Kershaw cards even though I'm not much of a player collector. 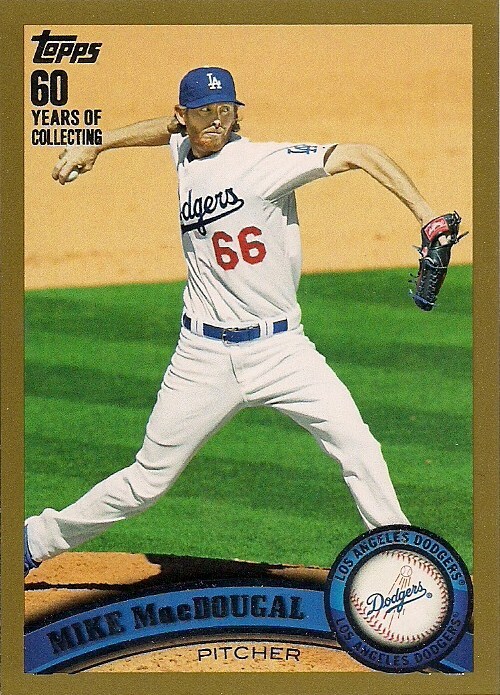 Seven years later, there are many, many more Kershaw card collectors than there were in 2008. 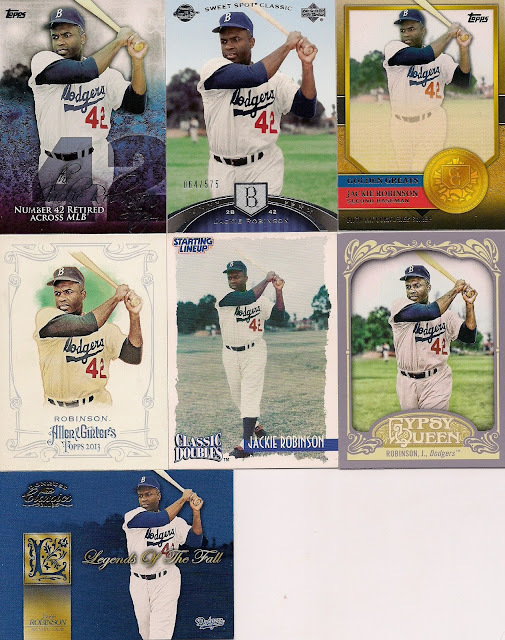 I haven't bothered to seriously pursue his cards because the prices are too high for me, and I'm still wrapped up in sets and accumulating every Dodger card I can. But I do make it known that I want each and every Kershaw card and that's grown my collection at a rather modest rate. 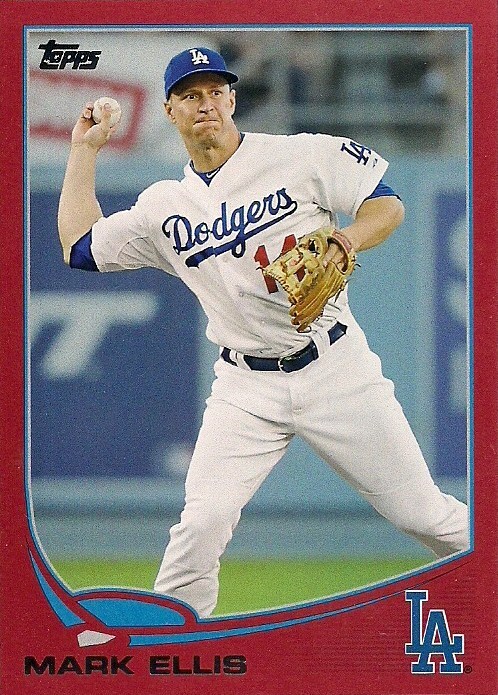 The Underdog Card Collector sent this 2013 Turkey Red card of Kershaw to me recently. 2013 Turkey Red was an online boxed-set exclusive a couple years ago, and I didn't feel like throwing $50 at cards for the few Dodgers I wanted. But eventually all of the Dodgers except Kershaw came my way. 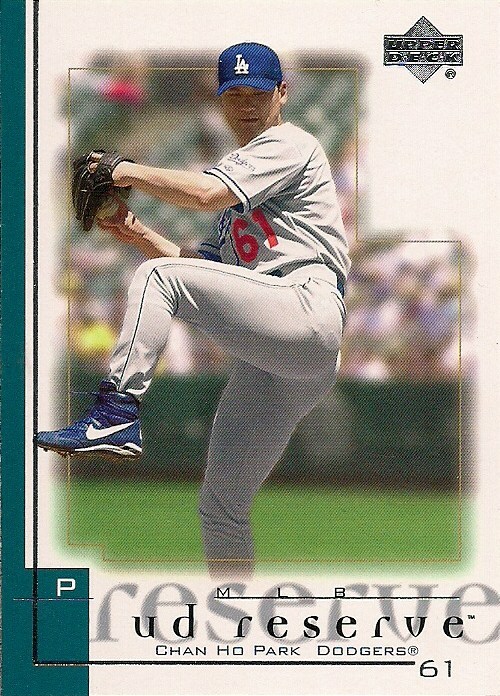 And now, Kershaw settles into place, too. It turns out he was just waiting for the right moment. 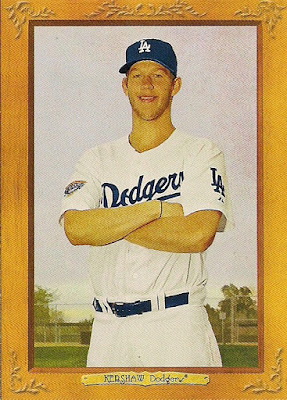 This is it: this is my 400th Clayton Kershaw card. 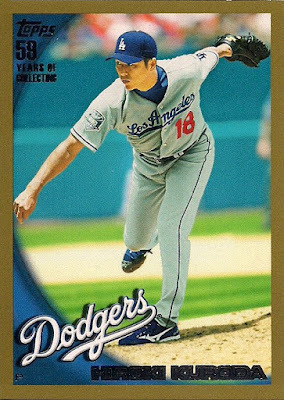 It's not a huge total by player-collecting standards, but in terms of individual players in my collection, only Hideo Nomo appears more times than Kershaw, and someday Clayton will go beyond Nomo, I'm sure. Zach sent a few other needs as well. 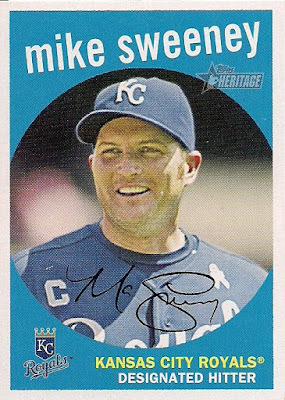 Speaking of 2008, this is a short-print from the Topps Heritage set that serves as a reminder to never try to complete another Topps Heritage set. Seven years later, I'm still 25 cards or so away. 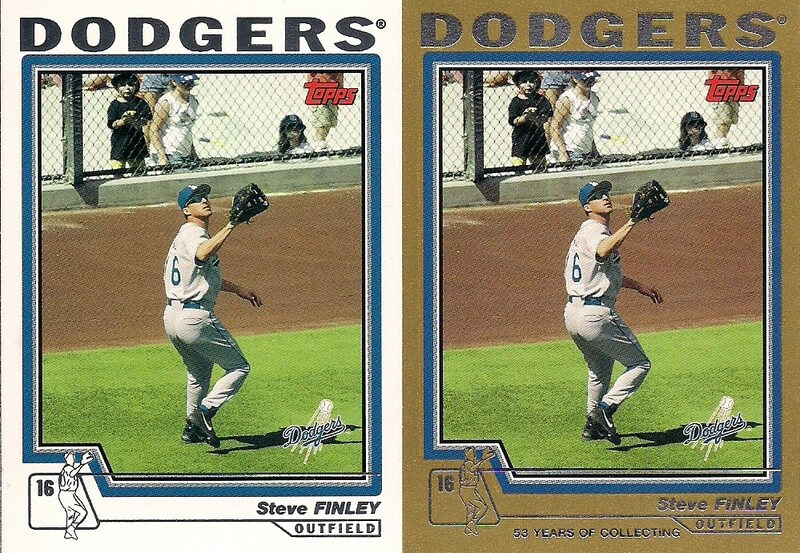 And going farther back into time, here's a 2004 Traded card of Steve Finley with his golden twin, each featuring a freaky looking kid in black in the background that might be the first chapter in what happens when The Omen visits the ballpark. But enough of the creepiness, it's celebration time! 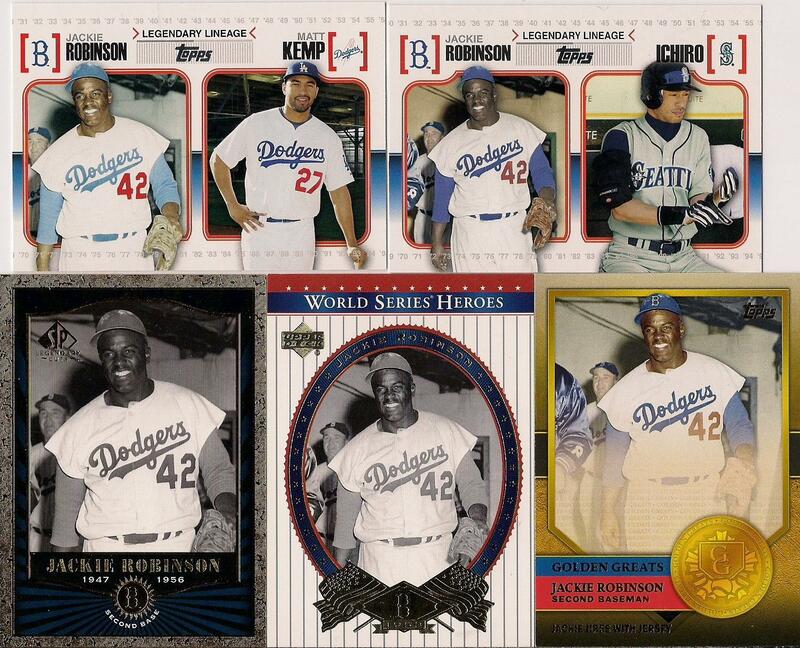 My Kershaw collection is 400 cards strong! Only 100 more to 500. That's when you really know this collecting thing is a sickness. Lately, Cardboard Appreciation has been converted into a "dumping ground" for cards I have acquired as potential selections for the 100 Best Baseball Cards of the '70s countdown. 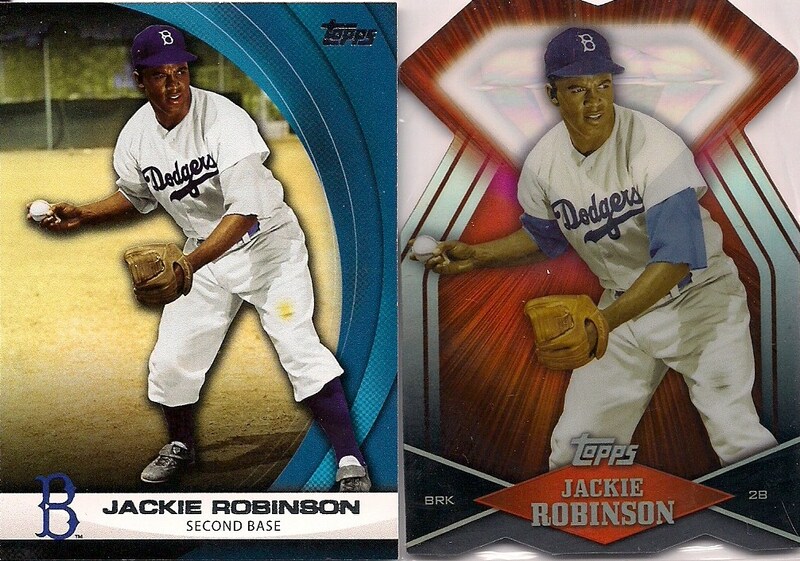 But I can't think of any better examples of cards that I am appreciating than these ones. 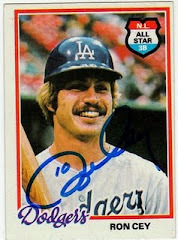 I love cards from the '70s, and have viewed virtually all of them in my time as a collector. 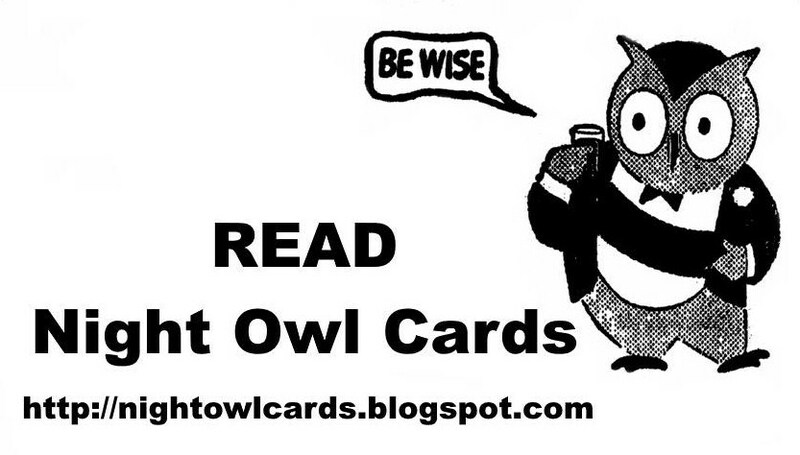 To stumble across one that either I have not seen or I maybe saw in passing online or at a card show, is quite a hoot. They become my New Favorite Cards. This Dave Ricketts masterpiece arrived today. It speaks to me in a way that only cards from this time period can. 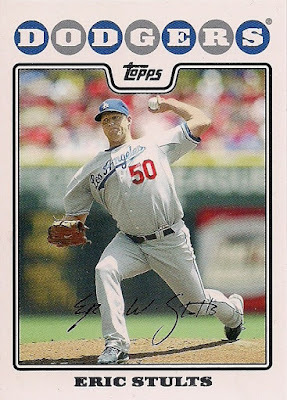 It's more of a '60s card than a '70s card because Ricketts was in the final days of his career at this time. And those glasses are definitely not the tinted lenses of my favorite decade. But this is why I like it. It's a card on the fringe. 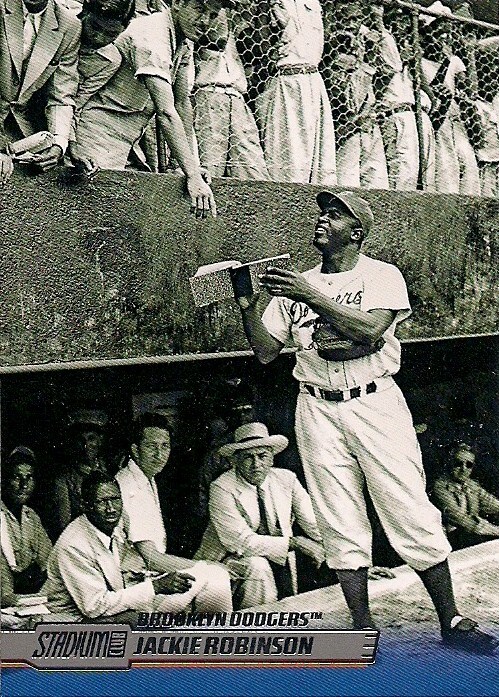 A man pictured with one team (the Cardinals), but masterfully turned into a Pirate. A new team and a new decade. Yet, he's trapped in the '60s. In the distance, men in blue and green slacks watch Ricketts' reluctant transformation. 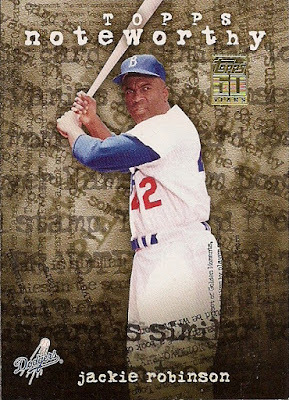 I don't know if this card will make the final 100, but it has an excellent chance. 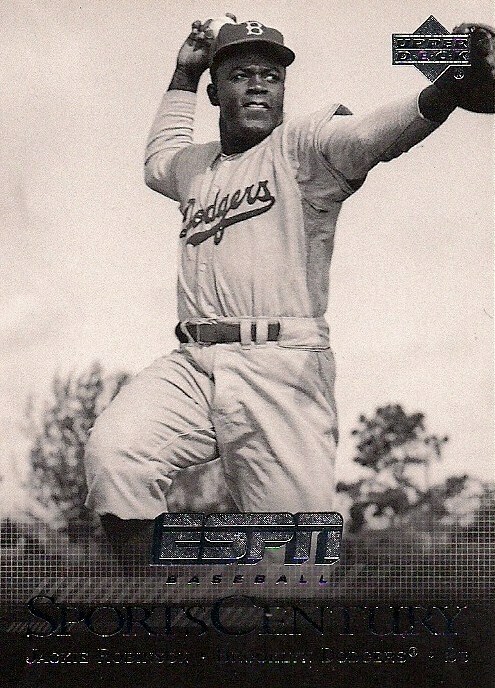 I also grabbed this card, because I laughed the second I saw it. 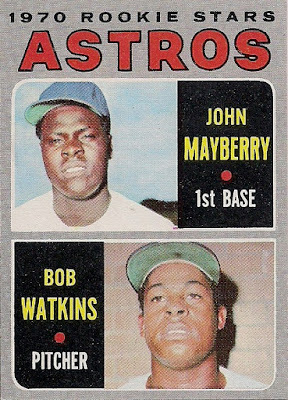 Among all the baseball cards that could double as mug shots, this one might have them all beat (perhaps, I need to do a countdown of "baseball photos as mug shots" cards). 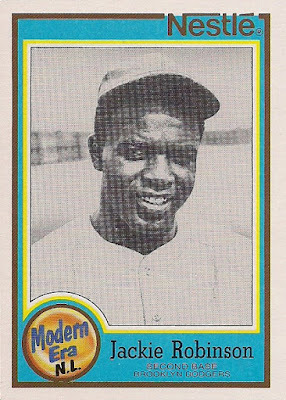 John Mayberry, of course, became a breakout slugger for the Royals, also playing for the Blue Jays and Yankees, and his kid is playing for Mets now. I read about Mayberry in one of those Tempo baseball paperback books when I was a kid. 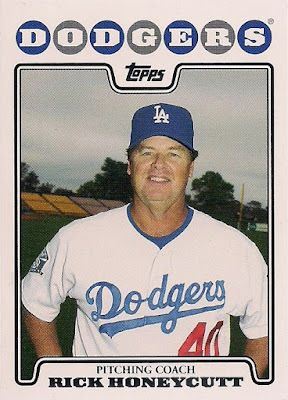 Bob Watkins, I don't know. He pitched in just five games for the Astros in 1969 and never returned to the major leagues. 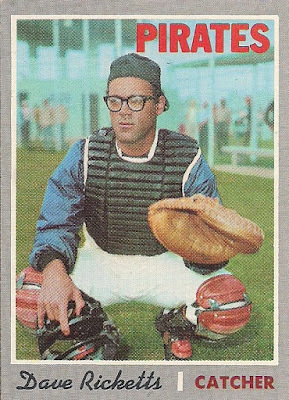 He was out of pro baseball by 1972. I'm sure he went on to live a fulfilling existence and not the life of crime that this card seems to suggest. I don't know if this cards will make the countdown, but I had to have it for my collection. 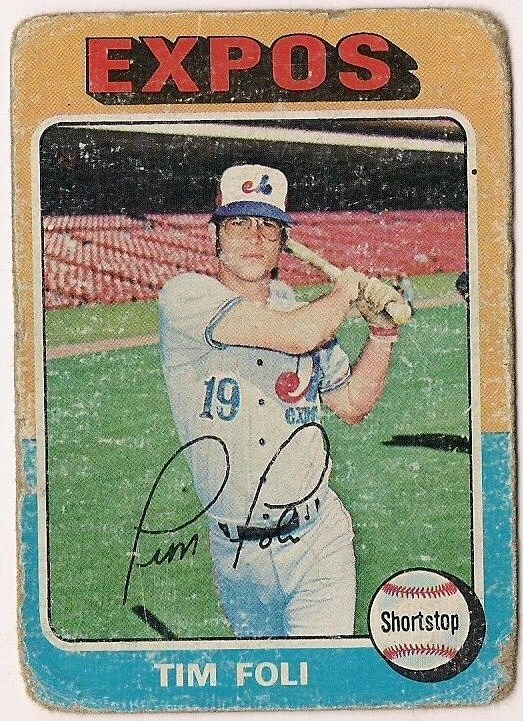 I have my eye on several other '70s cards that are also countdown candidates, but I'll wait for the money to come in again. I used to fret that the process of putting together this countdown was taking too long. But now I enjoy the pace. I want to take my time and turn up Topps and non-Topps cards (yes I've decided to add Kellogg's and SSPC and Hostess to the list of possibilities). I want this to be the best cardboard countdown representation of the 1970s that's ever graced a computer/touch screen. One thing I'll never understand about card blogging is that when you write about paying money for cards at a card show, it always draws reaction, but if you write about getting cards for free from a fellow collector, few people bother to read. I don't get it. These are free cards everybody! FREE. They fit into my collection -- just like any card I'd buy from a card show -- except they cost me nothing. 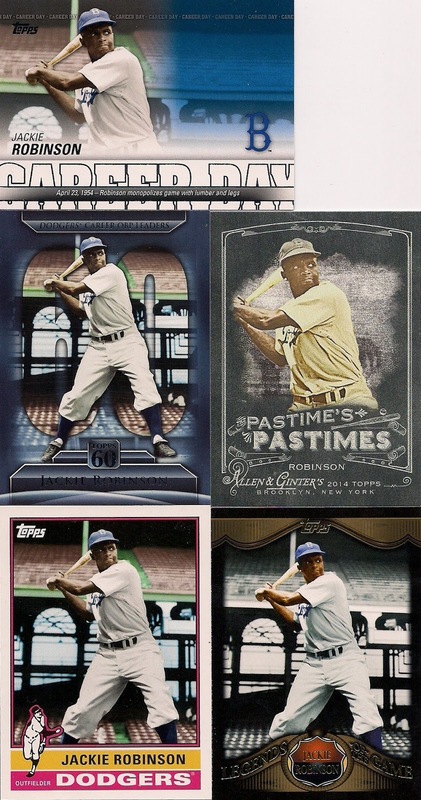 No nickel boxes, no dime boxes because there were no nickels or dimes expended. They were FREE. Doesn't that blow anyone's mind anymore? Are we so immune to getting free cards that it's worth at most a shrug? Maybe it's the story part of it. 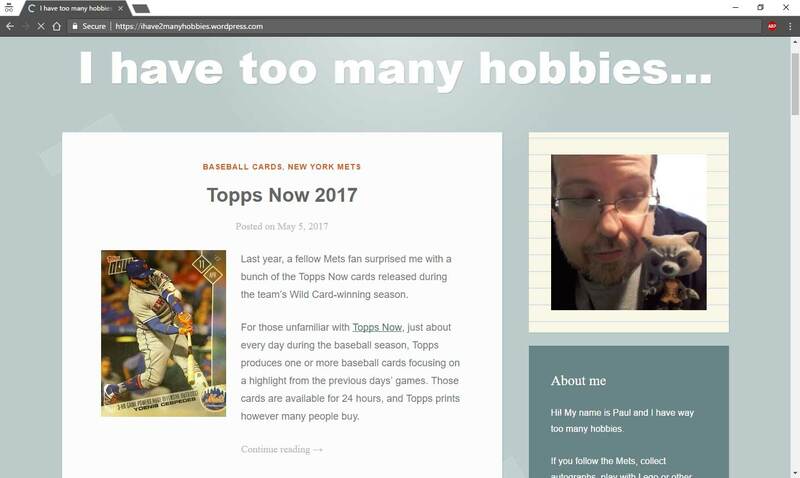 When I go to a card show, I try to tell a story about what went on when I was at the show. 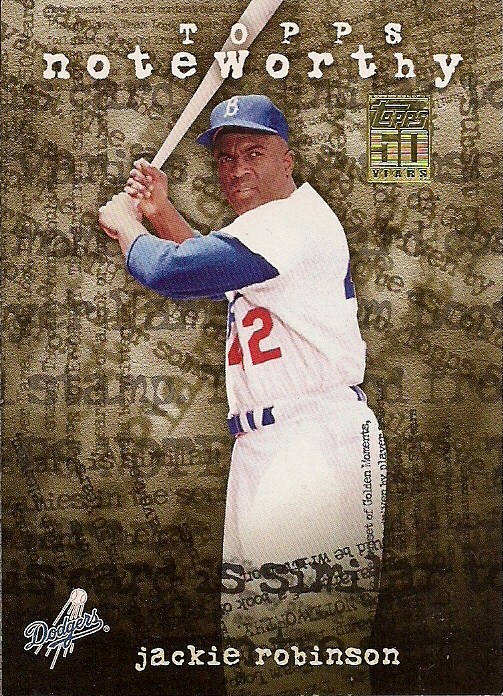 I don't just show cards, because I can do that on any post. A card show is an EVENT. It needs to be documented thoroughly. So, yeah, I'm having a real good time at a card show and I try to convey that in my recounting. Maybe that's the reason for more reaction. So maybe it's my fault. Maybe I'm not promoting these free cards that I get in the mail well enough. Maybe it's all in the delivery and readers sense that. Maybe I need to show the enthusiasm and effort, not the reader. Maybe I need to do a better job telling the story. OK, so let's try that. Last week was pretty crappy. I've been overloaded with work for just about all of 2015, but the last three months have been a joke. Something's going to have to change because I can't keep working like this and neither can the people around me. But for right now, the only casualties have been my mood, my ability to keep up with anything that is not work, and my attention given to other people's blogs. Plus, my attitude hasn't been the greatest, and I know it's come through on this blog. I don't have a lot to say in real life, because what can I say? "I worked again. It sucked." The house seems like it's falling down. Almost every day I add something else to the list of things that need to be fixed, but the list never gets smaller because there's no time and no money. The other day, while pulling out to go to work, I saw that a railing on the fence that lines our property had come apart, like someone had sat on it and it crumpled. Of course, I wasn't around to know what happened because ... shocker ... I was at work, but there's something else I'll never get around to doing. I'm generally a hopeful person. It will get easier. You know how teachers are always talking about summer vacation and just a few weeks longer? Well, I can relate to that a little, because when school is out, school sports stop and, holy hell, what is that? Oh yeah, it's me breathing again. Wow, exhaling feels good. But for now, that's all there is: hope. The knowledge that I have a family, my health, a dog who at least attempts to be good, and hope. (Oh, yeah, and a job and a house, but I'm mad at them right now). Now ... into that bit of drudgery and frustration, dropped a card package. I went to the mailbox, and there was a golden envelope from a guy named David. He's from Texas (there sure are a lot of card collectors living in Texas). And he's a fan of vintage cards, the Dodgers and the Angels. I know that because he wrote me a little note. That's pretty cool. Someone took the time to write five paragraphs about what they collect and how they enjoy my blog. Do you get that kind of interaction from a dealer across the table trying to sell you cards? I don't. These are collectors, not sellers, communicating, through the mail. Items like this have been showing up in my mailbox for almost seven years. I once never gave my mailbox a thought during the day. Whatever was in it could have sat there until 9 p.m. before I remembered to get it. That never happens anymore. I'm usually pulling the door open the second the mailman walks down the steps. Or, in the middle of doing something else after lunch, suddenly a happy tune jumps into my head: "♪ gotta check the mail! 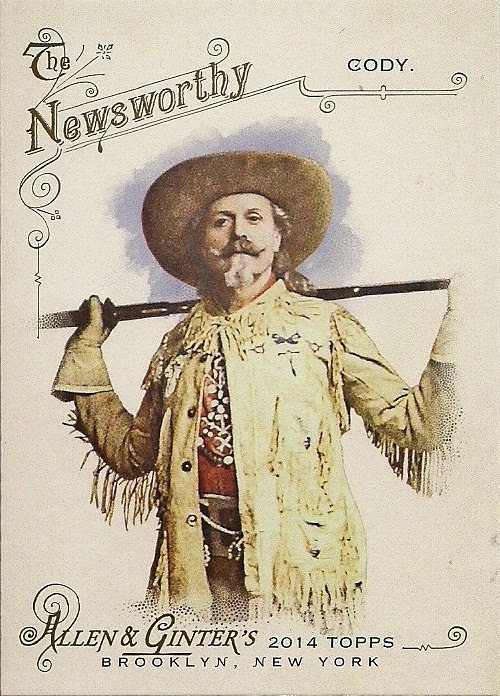 ♪"
Do you know how welcome this is given the rest of what daily life has offered lately? 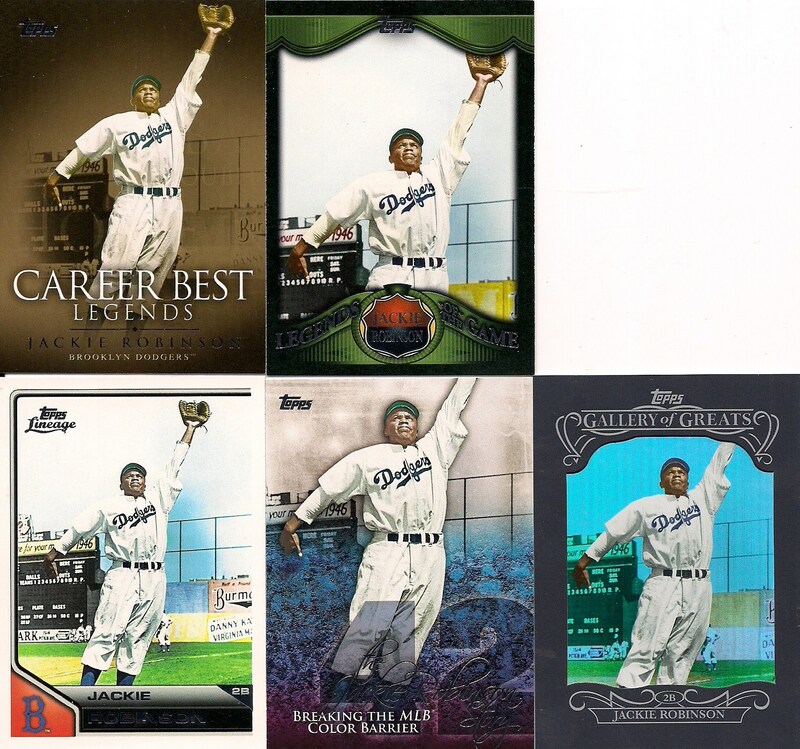 David sent a handsome stack of parallels. Only the card you saw at the top of the post was not a parallel. 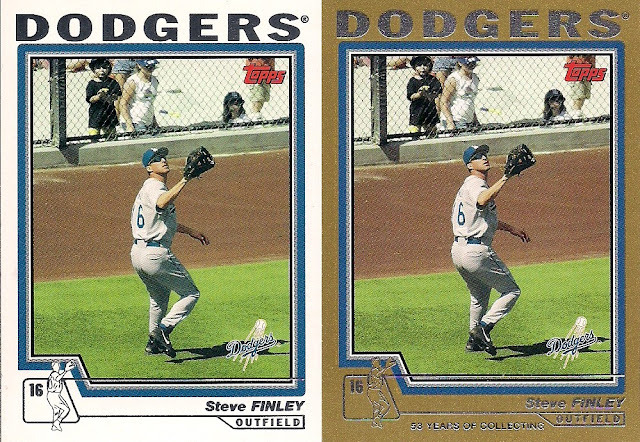 Gold parallels from 2004. All three of these cards have ties to the Braves. Moving on. 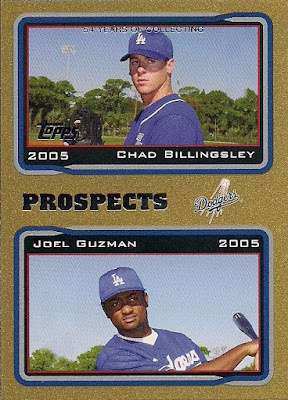 Gold parallel from 2005. 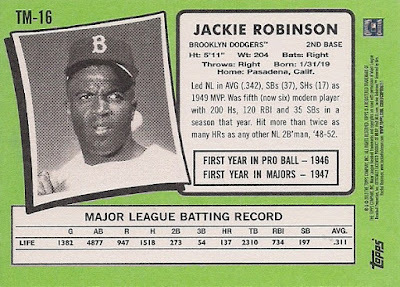 These two players, and therefore this card, used to be a big deal. Still a big deal to me. 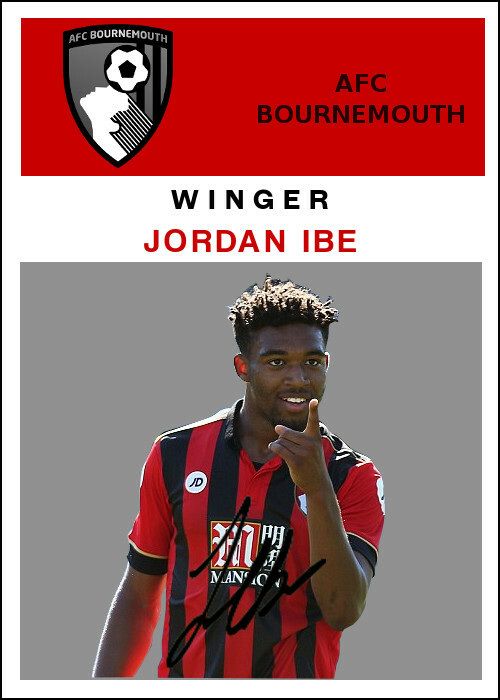 The card anyway. Gold parallel from 2010. I should find out how Kurorda is doing in Japan. Red and rain-forest parallels from 2013. Please stay a few more years, Zack. Dave knows my weakness. 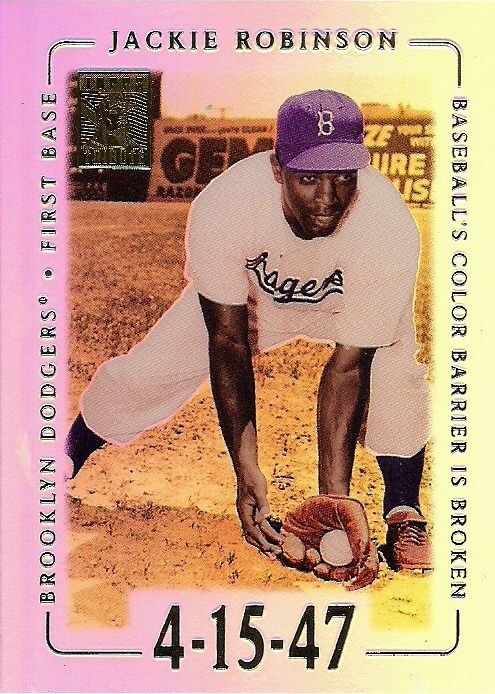 I'll never be able to quit colored parallels. 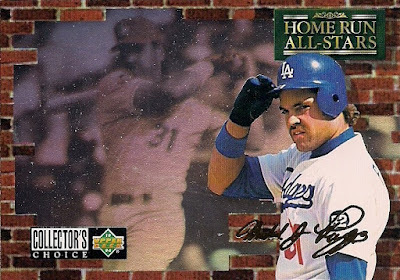 Plus, a gold signature parallel from 1994. 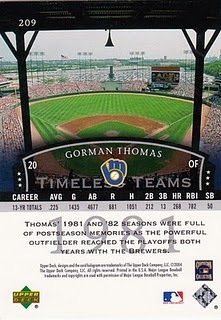 I consider this a parallel, although it showed up like three years after the original card. OK, not a card, but I'm treating it like one. Billy Ashley is getting coveted real estate on this item although it's screaming "Mike Piazza". OK, there's Mike. Big guys are always hogging all the space. This is very cool stuff. And it showed up for free. From a similar-minded collector. Who spent his own time to mention how much he enjoys my blog. The cards are his way of saying thanks. That makes these cards supremely better than a card I could have bought, especially to someone as broke as I am. 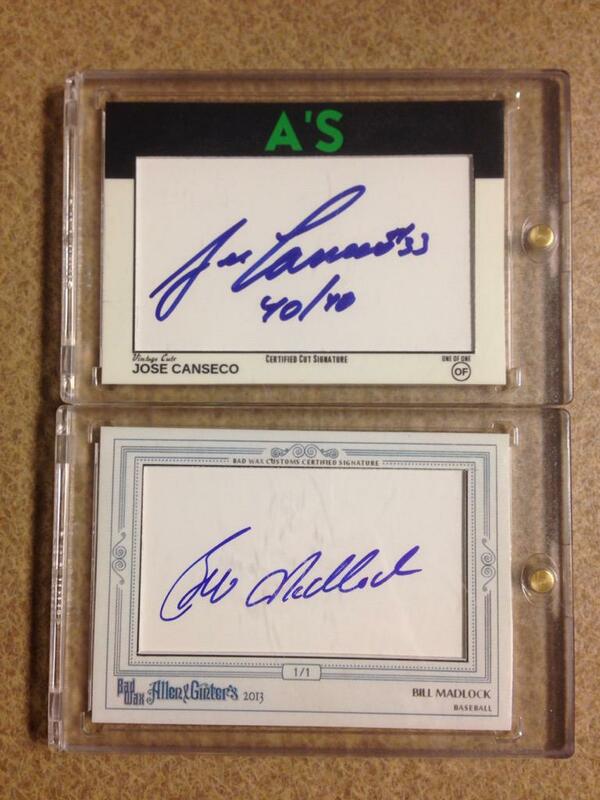 They are just as good as anything I obtained at a card show. And the gesture here is much more heart-warming than "I'll give you cards if you give me money." Sure, a card show is an awesome adventure for the collector. But this right here, this is the beauty of card blogging. And we repeat that wonderful ritual over and over here on the card blogs, so much so that we are not fazed by it anymore. These cards here are "nice pickups! ", too, and with a story behind them, as well. No, I didn't pick them out, but they all fit perfectly in my collection. Instead of digging through a discount box or binder, they showed up directly at my home, in the midst of all of life's difficulties, and I didn't have to pay for gas, endure traffic or fight for parking. A card package in the mail seems much more fantastic when it's put that way. But I guess we're immune. Last year, when Stadium Club came out of retirement -- again -- this card made the rounds as one of the best photos in the set. Strong words, because Stadium Club is known for its photos. 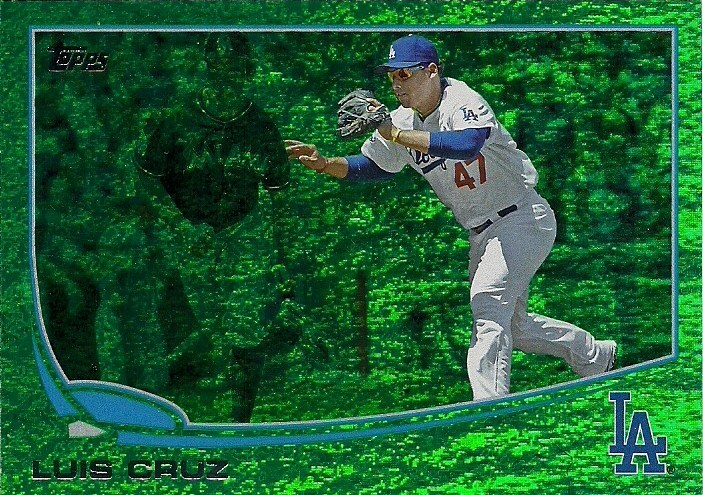 But I went as far as calling it the best card of 2014, and I still think it is. 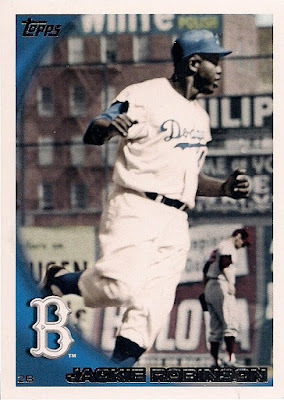 It's the best for a few reasons, but one of them is that I had never seen that picture of Jackie Robinson on a card before. That instantly makes it fascinating. 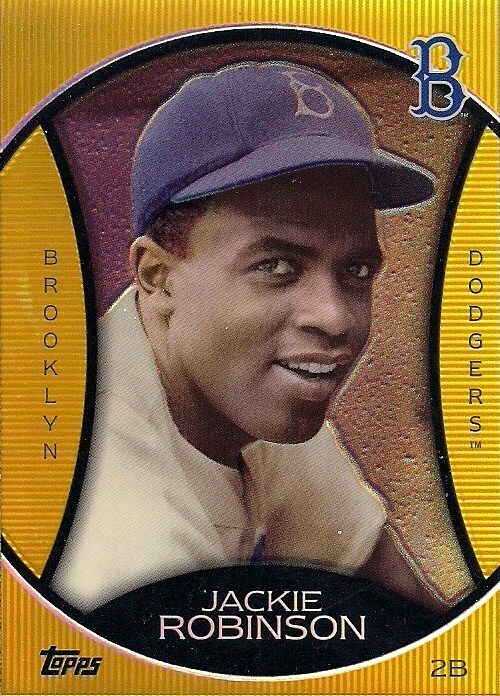 This is because collectors have been buried in Jackie Robinson cards for the last five or six years. 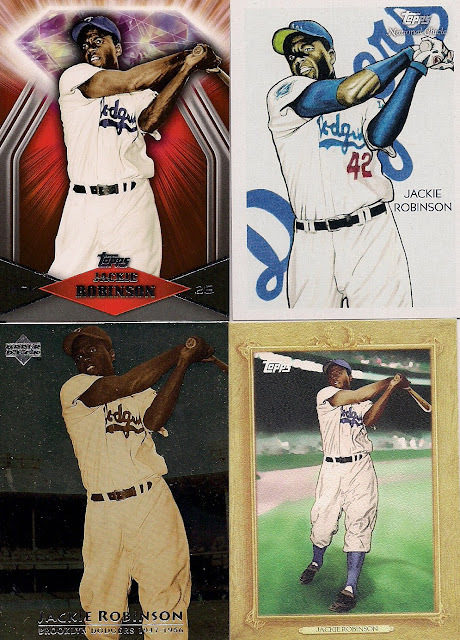 Robinson is in almost every set, either as a base card or an insert. 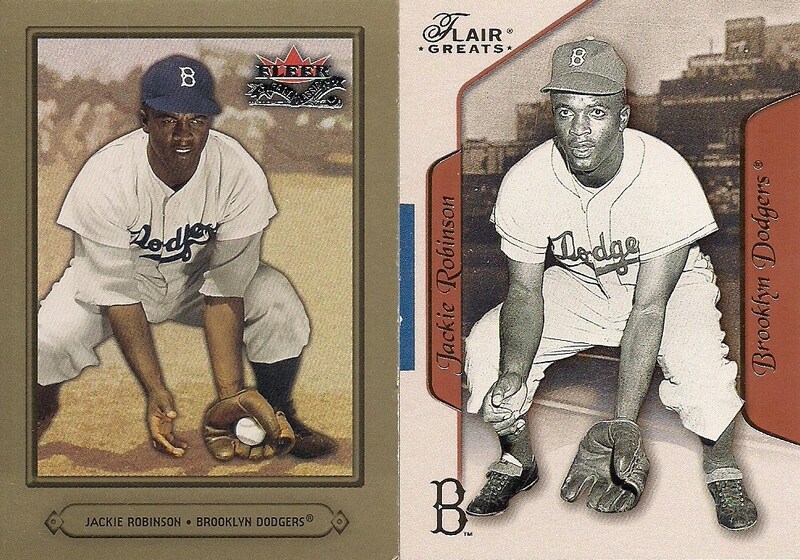 My Robinson card collection has grown like a weed until I am now numb to most Jackie Robinson cards. I'm numb not just because of the frequency but because of the repetition of the Robinson photos used. 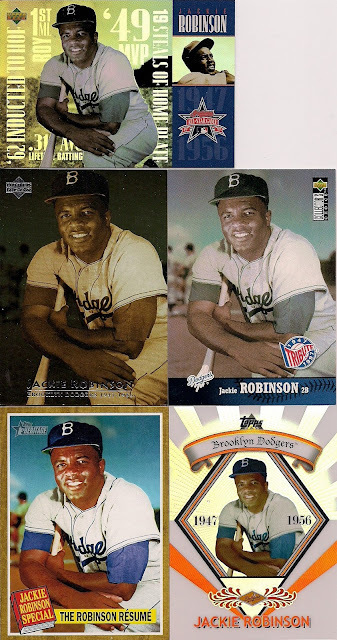 As you know, the same Robinson pictures have popped up over and over and frequently enough for me and others to rant about it. Repeated pictures is just about the most annoying thing about modern set collecting for me. I know that Robinson has been gone for over 40 years and new and different photos must be difficult to come by, especially considering that he played in the 1940s and early '50s, when there just weren't a lot of photos taken of ball players in comparison to today. But I DO see new photos of Robinson show up on cards every year. And then I see the same repeated ones popping up with such annoying frequency that I can barely collect them. So why are the same ones used all the time when I know that there are different photos available (at least that's what the 2014 Stadium Club card seems to indicate)? I thought I'd figure out how frequent certain Robinson photos had been used. 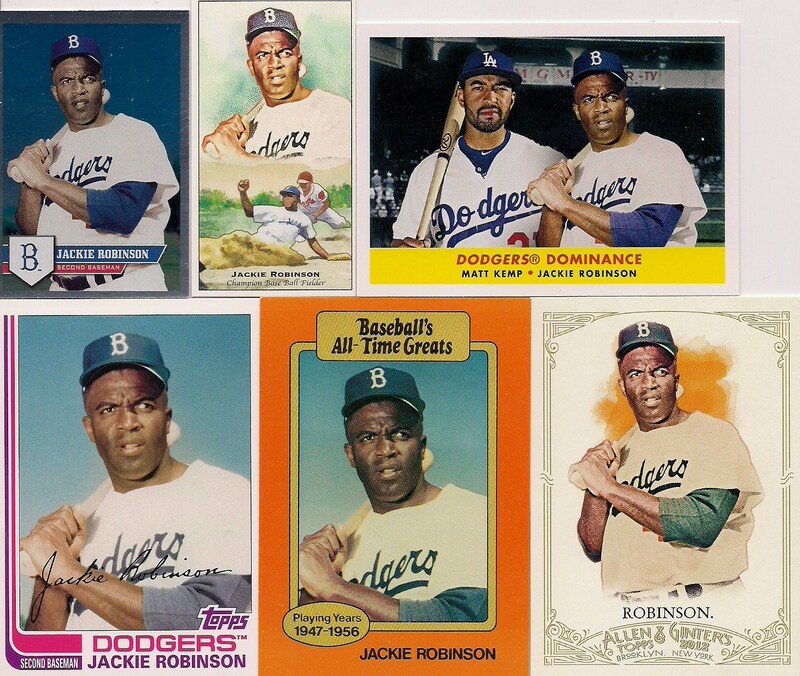 And how many different Robinson photos have appeared on cards over the years. Herein this post lies my findings. Grab a snack. This research pertains to only my collection. I know that limits it, but I do have nearly 200 different Robinson cards. I can at least make this interesting. I went through all of my Robinson cards, eliminated the parallels, and began counting. 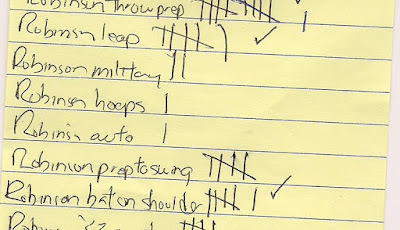 Notebooks are still the best way to count. I can't spend every waking moment in front of a back-lit screen. 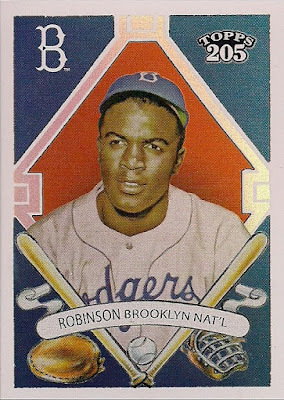 I documented every different Robinson photo and was surprised rather quickly with how many different ones there were. The scan above is just 7 or 8 lines of a 16-line page. And there were six pages filled from top to bottom. 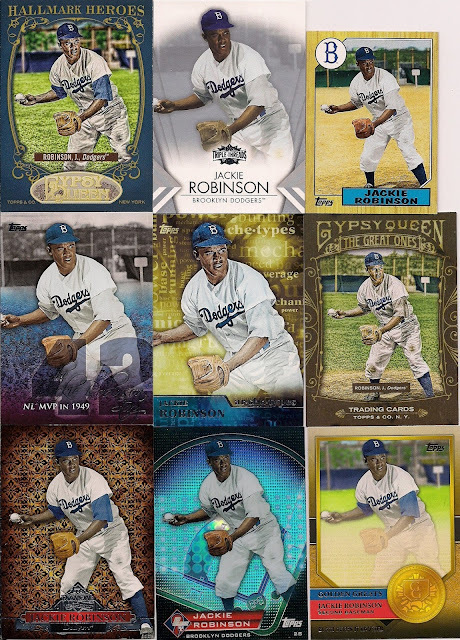 I counted at least 82 different Robinson pictures. 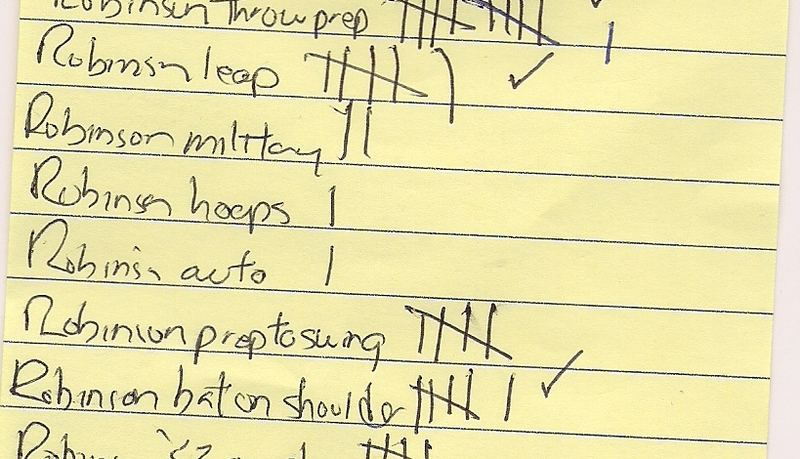 I'm sure I duplicated a couple, so it's probably more like 79 or 80, but I was shocked that there were that many. 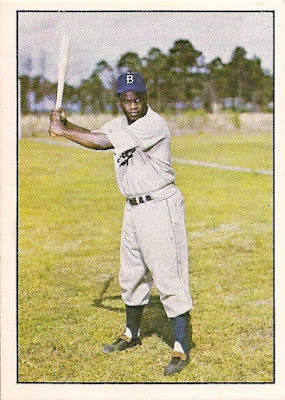 You see enough of the same image over and over, you begin to think the world has actually run out of Jackie Robinson photos. "Oh, well, he did play a long time ago." But that's not entirely the case. 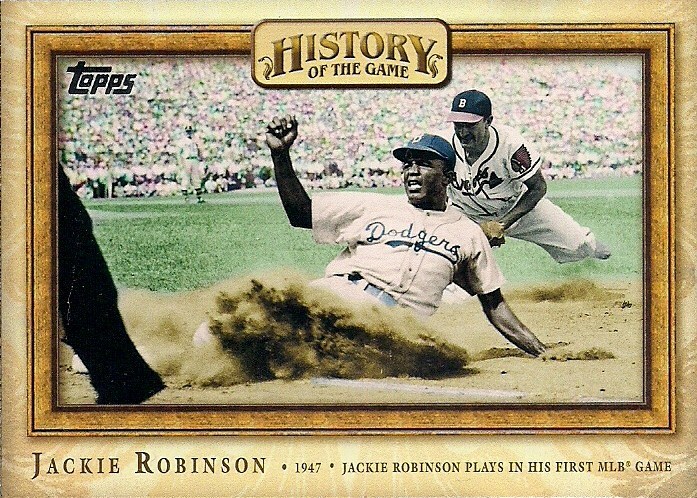 That is not a Robinson photo that I have seen on a card. I'm sure it's been on a card somewhere, some year, but it hasn't ventured into my collection, so I know it hasn't shown up a lot. 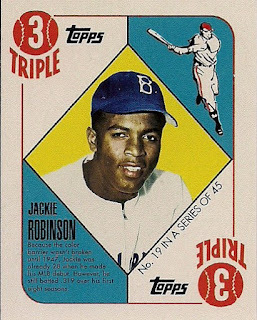 This card, and last year's Stadium Club card, proves that there are new Robinson photos to be had. 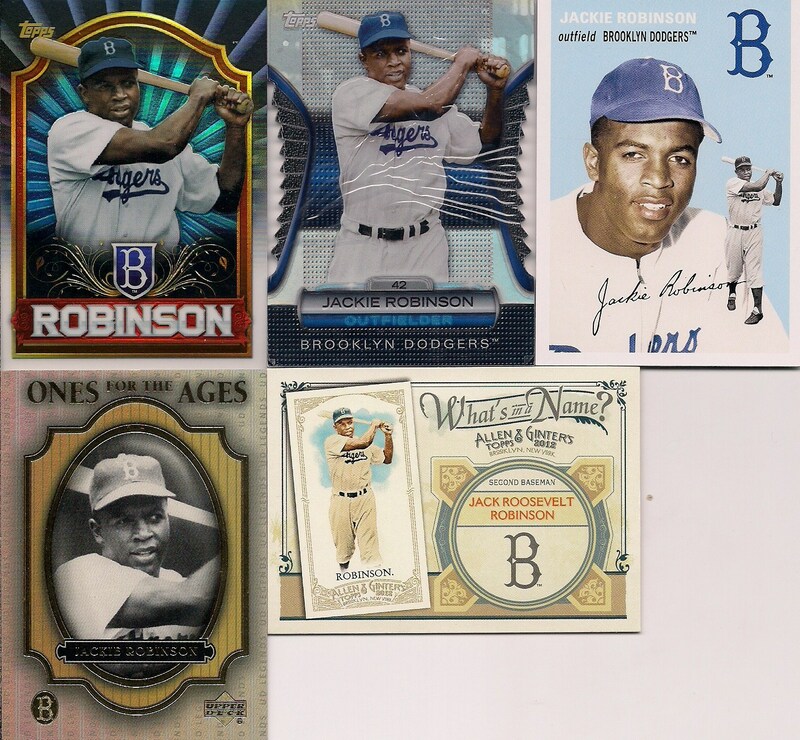 Almost every year there are new Robinson photos on cards. This one is from 2010. This, too. (2010 was a pretty good year for new Jackies). 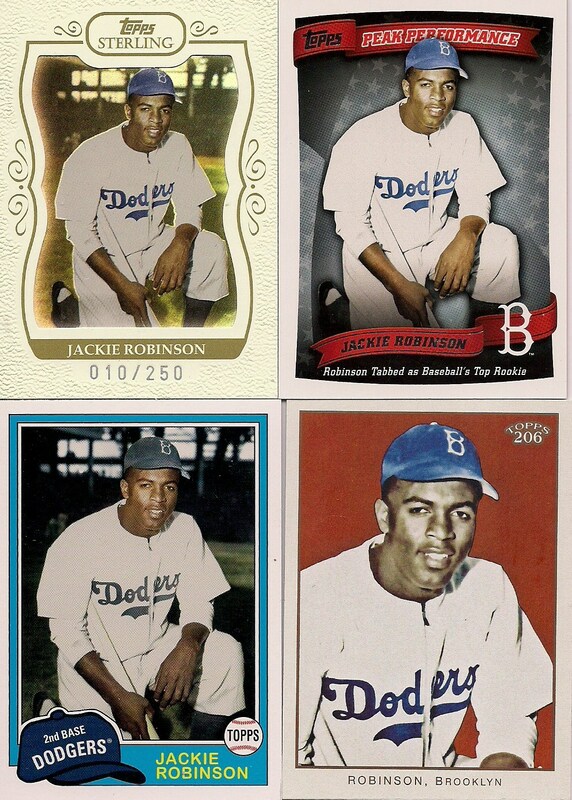 Each of those photos are listed just one time on my Jackie count list. 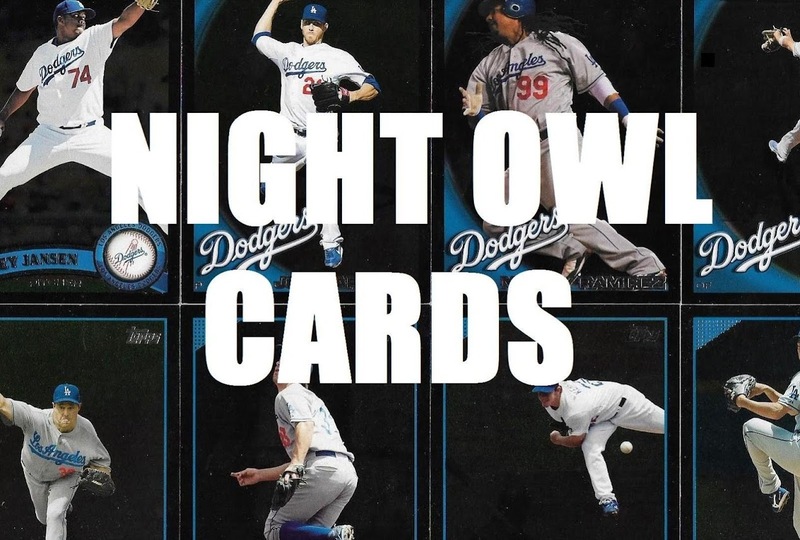 There is no other card like each of those ones. 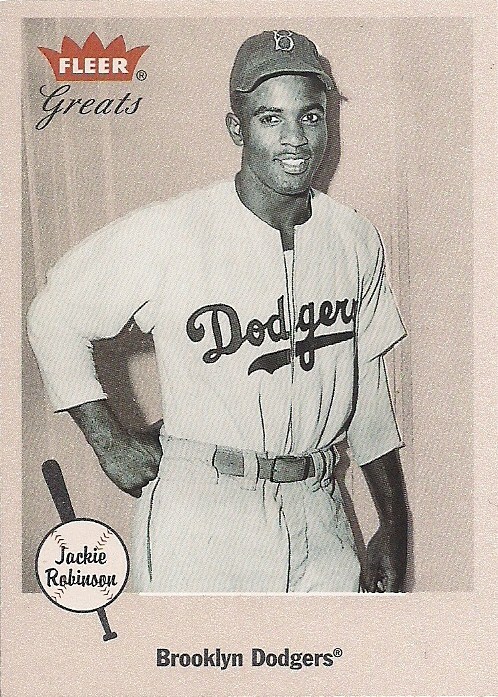 Look that ball into the mitt, Jackie. These each showed up only once, too. ... all the more annoying. (You're not fooling anyone, I know that's the same photo as the cards above it). 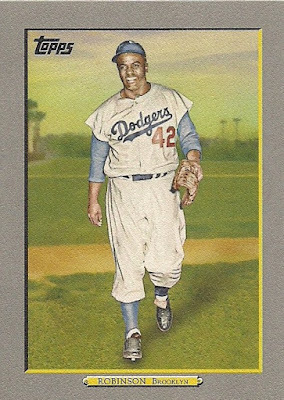 There are some images of Robinson that have shown up way too often and they just need to go away for a long time -- at least on cardboard. Here is Jackie Robinson walking in the dugout or through some tunnel near the clubhouse. He seems pretty happy. But I don't need to see it this many times. Topps tried to fake me out by replacing the ballplayers with a grassy background. In fact, I was bamboozled for a minute there. But I caught on. That's the same picture. 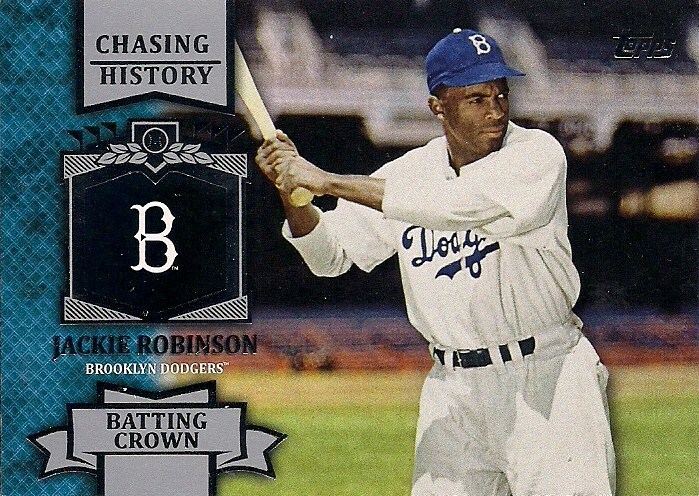 Robinson on one knee, leaning on a bat. 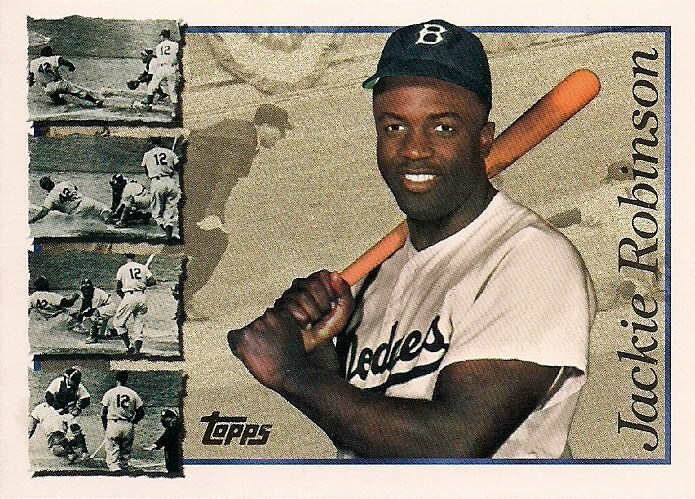 This was a standby photo in the late 1990s with Upper Deck. 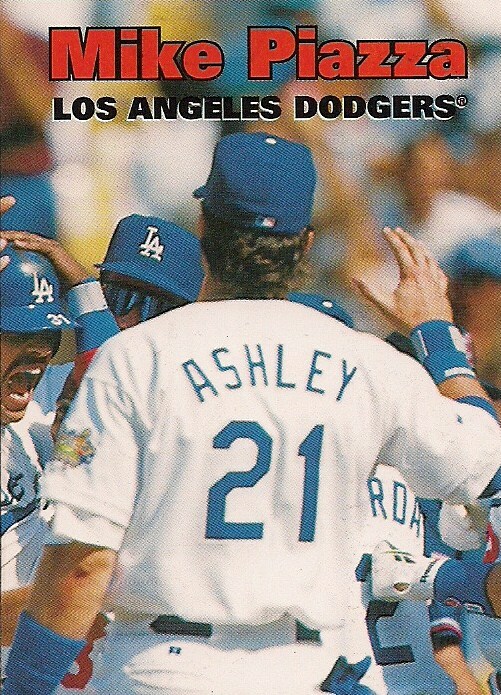 Then Topps used it 15 years later. I'm sure if I look around my collection some more, I'll find at least another card with this image. 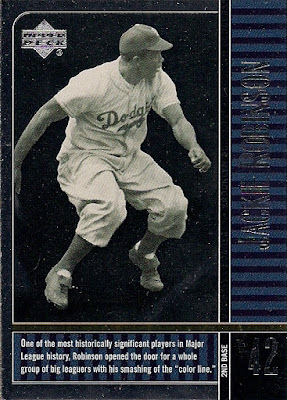 Topps can chalk-up the picture or make it horizontal, but I know that's the same image of Robinson striking terror into the baseball headed in his direction. One more honorable mention. I thought for sure I had more of this image than any other, but I guess not. 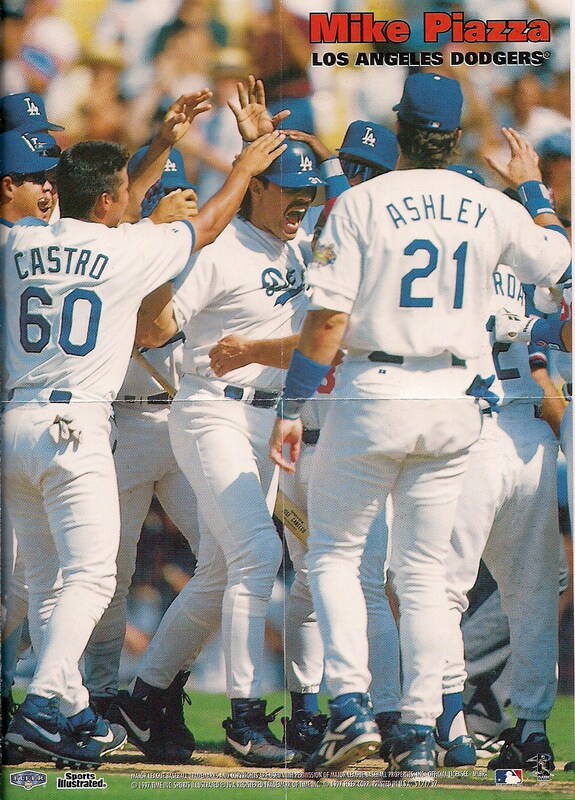 The picture is so memorable, especially if you can see the scoreboard in the background, that it sits in your brain and doesn't let you forget. This picture is very similar to the ones above, but it's not the same. 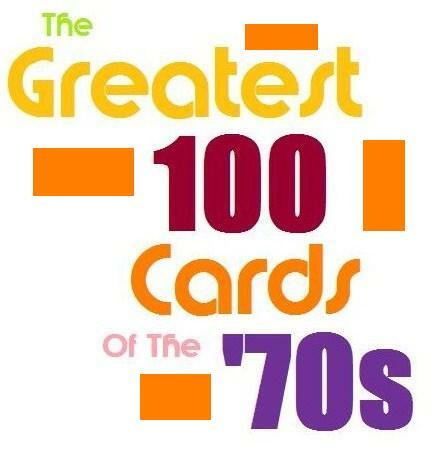 This is from the Renata Galasso Greats sets from the late '70s (hands off those cards, I'm coming for them!). I saw this very early in my younger collecting days and it's been a favorite. So why not use this picture a few more times if you're going to repeat pix? 4. Robinson drills an opposite field double down the line past hopelessly overmatched first-sacker Whitey Lockman. Everything from mid-1990s Starting Lineup to the special Target set from this year that I'm still (shame washes over me) trying to complete. One of the puzzling things about these most frequently used final four is the unspectacular nature of the images for all of them. If you're going to keep serving up the same old slop, at least make it tasty. 3. 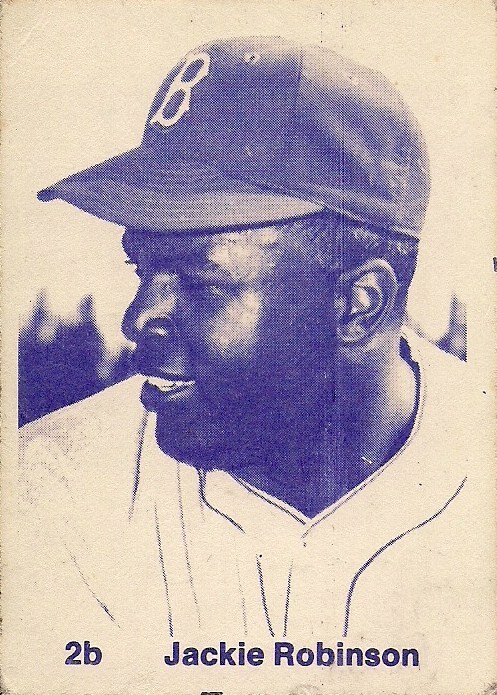 Robinson stares menacingly at the Yankee fan, bat on shoulder. A foul ball is coming the fan's way. Be alert. Yes, I know, six is less than seven. I'm getting to that. This assortment includes the very creepy card of Robinson posing next to Matt Kemp even though Robinson had been dead for 40 years when this card was made. Wooooooooooooooooooooooooo! I've added the sticker in this assortment of cards because I don't want Topps (or any card company) thinking they can get away with duplicate images on stickers because "who's going to know? They're stickers." I know. OK, there is a seventh card with this image. I'm counting this as No. 7 because someone tried to sneak around the back way and got caught. 2. 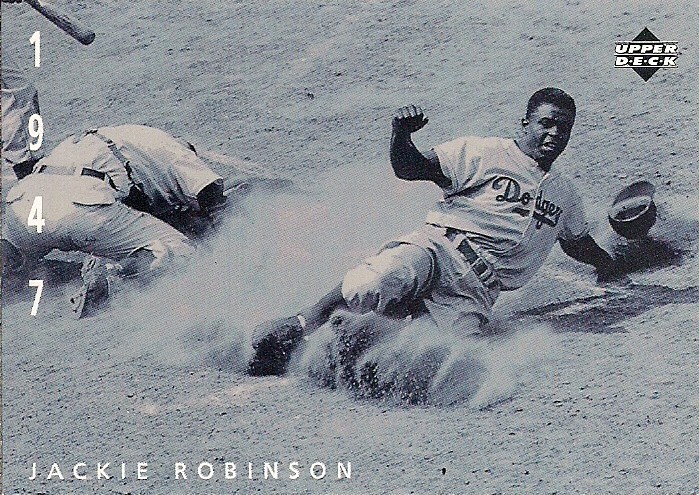 Robinson's about to send a missile to Gil Hodges at first, hope the Epsom salts are stocked. It's interesting to me that this image, which is much like the image at No. 2, can be found on just three of my cards and from 25 years ago. It hasn't been used since, at least not that my collection can tell. 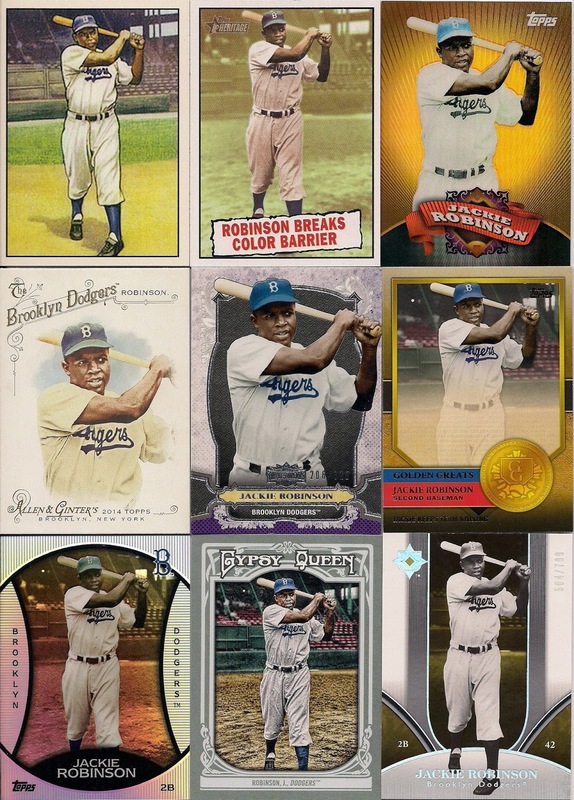 I know that licenses and photo rights and money are probably the answer to a lot of my questions here, but amuse the confused collector a little while longer. 1. 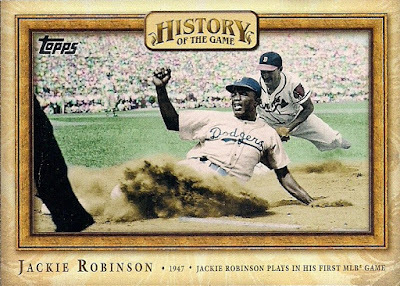 Robinson pulls a double down the third base line past a woefully outwitted third-sacker Hank Thompson. The most-used Jackie Robinson image in my collection originally appeared on a card in the 1950 Bowman set. 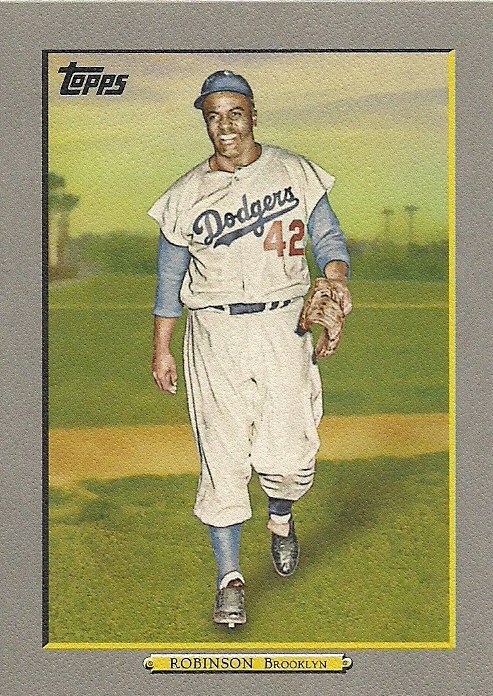 It was Robinson's last appearance in a Bowman set from the 1950s. It's another one of those poses that I don't understand why it reappears so often. 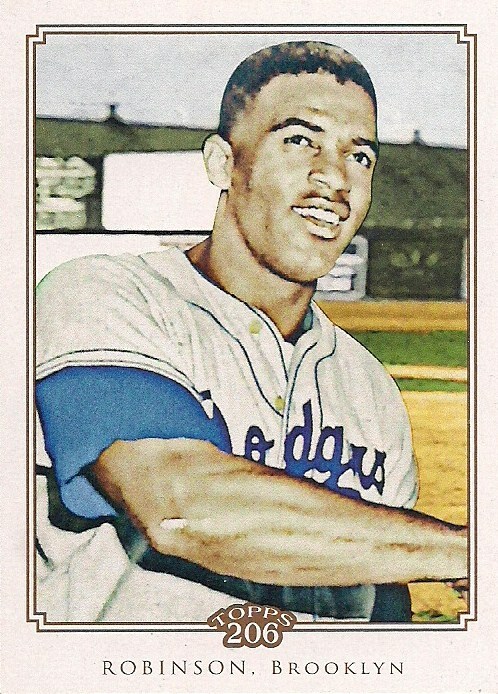 There's nothing exceptional about it except for the fact that the player pictured is exceptional. I know, I know, you don't want to see anything 14 times. Repetition kills the image. It kills the mood. They've shown up once, maybe twice on cards. And that's probably why I enjoy them so. We've been living in the retro world of card collecting for quite awhile now. 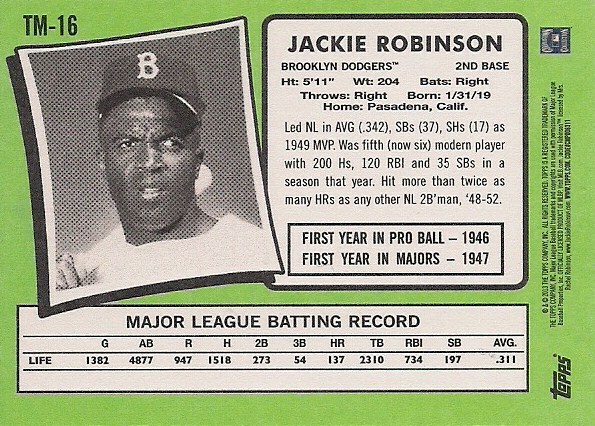 As far as posthumous Robinson cards go, there wasn't a whole lot through the 1970s and 1980s and early 1990s. But Robinson returned to major sets in 1994 with Upper Deck. 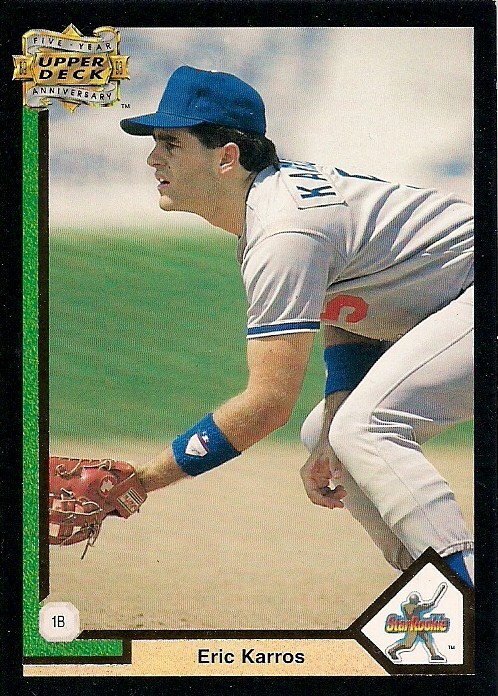 He was back in Topps sets in 1997. Note that both of these images are the only times they appear in my collection. After a low occurrence of Jackies through the late '90s, he emerged again with a force in 2001. 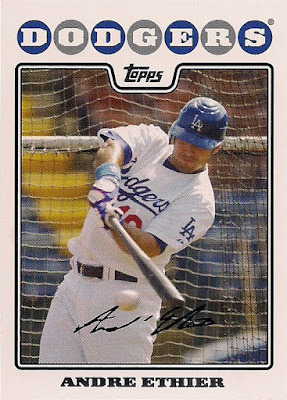 Most of those pictures are new and different and enjoyable (most on Upper Deck and Fleer sets, too). But by 2009, we were seeing the same pictures over and over and over. And now that I know there is so many different photos to choose from, I wonder why the repetition of the same shots. It's got to be licensing, right? 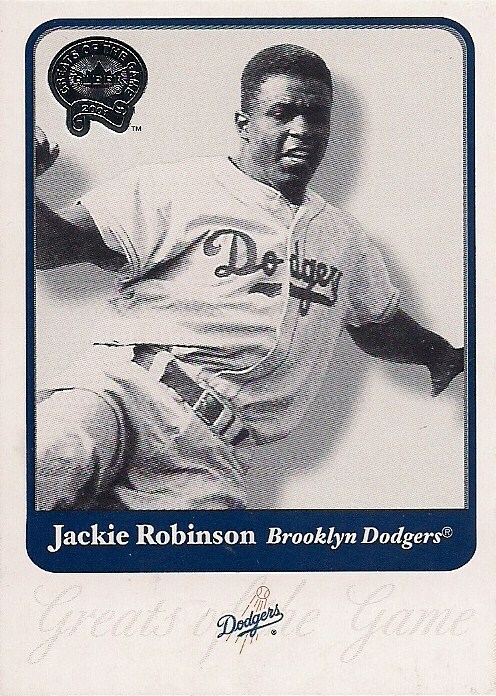 This is the first Jackie Robinson card I ever owned. 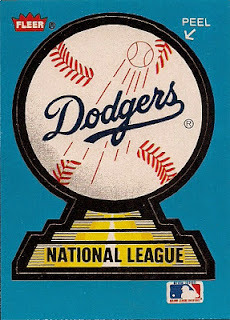 It's from the 1975 TCMA All-Time Dodgers set that I ordered from a catalog. I've loved this image in all its purple glory ever since. Going on at least 35 years now. I've yet to see this picture of Robinson on another baseball card. But, for this one image, I think I'd like it to stay that way.